Join the discussion on our forums! Come discuss Bloodhoof Brave over in our dedicated Bloodhoof Brave discussion topic. Taunt Has +3 Attack while damaged. Staple in control warrior. Very strong card. Favorite card of the set, it's hard to miss Sludge Belcher with this guy around. What's up with the pigtails though? Not pigtails, that's just how tauren fashion their beards! 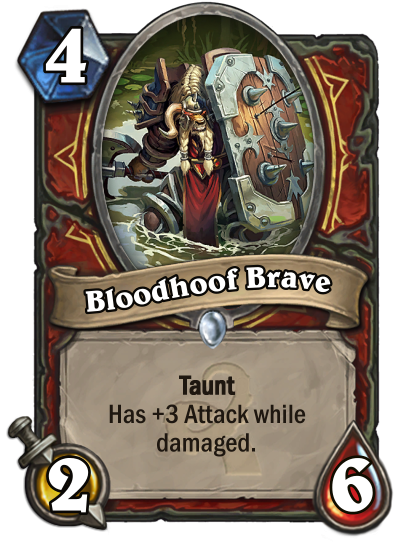 this card is very good with its 6 health it will likely survive your opponent's turn, or trade 2 for 1, of it survives you can enrage it and kill a big minion with it's 5 attack. Because it is very likely that this minion will be enraged before it dies, it is a solid card. thats is how you make a good enrage taunt card, big health with subpar attack, but end up equalizing when enrage activates. Want to have another go at that? Sadly no 2-attack 4+mana minion without battlecry or choose one effect became popular. Am I wrong?